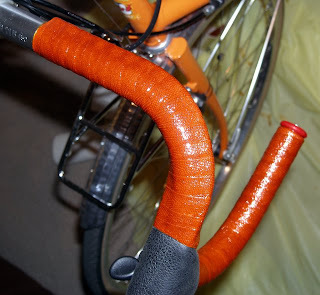 Many of the great French builders wrapped handlebars in cotton tape coated with shellac. Today cork tape is the norm. While cork tape does provide better cushioning, it is fragile and needs to be replaced at least once a year. Shellaced tape lasts for years, or even decades. When it gets worn you can simply brush on a fresh coat. As for appearance, well look at the photos and judge for yourself. Even well worn shellaced tape has that special beauty or patina that's only evident in natural materials. Yes, shellac is a natural material. It is the crusty secretion of the lac beetle (Coccus lacca) that lives in the forests of Assam and Thailand. It is a natural polymer that when dissolved in alcohol makes a varnish like coating sometimes called "French polish". Though I've never eaten any, I understand it's edible, however, denatured alcohol is not. You could dissolve it instead in good-natured (grain) alcohol. Shellac may be bought pre-mixed at most hardware stores in clear and amber tint. But it is better to mix your own from dry flakes (which are available from VO) that come in clear, amber, and garnet shades. Shellac should be fresh. Old shellac may not dry, will not be as clear, and may not be as water resistant as fresh. It must also be free of contaminants, such as water. It is better to mix a small quantity of flakes with denatured alcohol as needed, rather than rely on a pre-mixed can that might be old. And since pre-mixed shellac is often available locally only in quart cans, the average rider will never use up even half a can before it gets old. Shellac will add its tint to cloth tape. 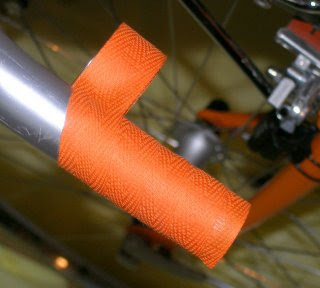 I like to experiment to find the best color tape and shellac for a particular bike. 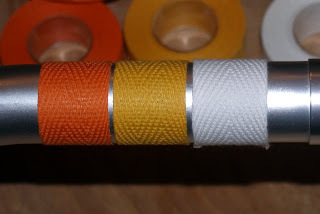 This photo shows the three colors of cloth tape I was considering for a new bike. Here they are with a coat of shellac. 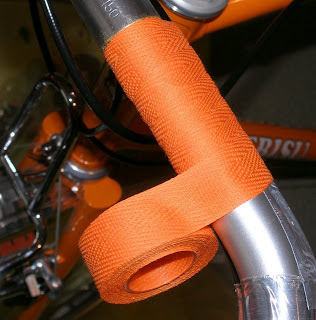 I wrap handlebars in a style I've seen on some Alex Singer bikes. I think his method differs from that used by other constructeurs, for those of you who follow such trivia. Both methods involve starting the wrap at the stem-end of the bar, thus eliminating the electrical tape or twine required to finish a wrap started outboard and leaving a cleaner looking bike. But Singer's method involves wrapping the top half of the bar from the center out, and the bottom half from the end in. "But why is this better and who cares?" you ask. Well, Singer's method not only looks better, but it prevents the rider's hands from 'curling' the tape as he pushes forward on the drops. If using brifters or aero levers, I secure the cables with duct tape (the good metal foil type) rather than with black electrical tape which can show through light-colored cotton tape. The metal duct tape is also used to secure the ends of the cotton tape under the brake lever hoods. Wrapping bar tape is not easy and it often takes me several tries to get it looking nice and even. It usually takes 3 rolls of tape for any, but very narrow, bars. Wrapping from the center toward the brake lever. Note the lack of twine. Wrapping from the bar's end toward the brake lever. Shellacing handlebars is pretty darn simple, but I'll go through it step by step anyway. I've spent countless hours varnishing wooden boats, and one thing I've learned is that it pays to have a good brush. Good brushes hold more shellac and so don't need to be 'dipped' as often. They leave a smoother finish, and they last almost forever. I won't suggest you buy a $50 varnishing brush, but a decent quality bristle brush (like the one in the VO shellac kits) is worth the investment. I use a semi-disposable brush called "The Fooler" that's popular in the marine trades. It's made in Indonesia from pure bristle, has a proper wooden handle and costs around $3-$4. In addition to a brush, you'll need a bit of masking tape and some alcohol to wipe up any spills and clean your brush. First mix your shellac according to the instructions. Remember to use only denatured alcohol from the hardware or paint store, never rubbing alcohol which contains water. Shellac flakes take a long time to dissolve, between 8 and 24 hours. I mix in an old glass mason jar that I leave on my desk so I'll remember to give it a vigorous shake every hour or two. That way I'm ready to shellac after work. If you use aero brake levers or brifters, secure the cables to the bars with electrical tape or metal foil tape. Tape your bars and put a wrap of masking tape (or any type of tape) around the center section of the bar to keep shellac off. Spread a drop cloth under your bike, or roll it outside. I don't bother to mask-off the bike because any shellac dripped on it can easily be wiped off with a paper towel dipped in alcohol. I pour as much shellac as I think I'll need into a paper cup or old jar; that's about 6 or 8 ounces for 6 or 7 coats. If any is left over after the job is finished it will be discarded, not poured back into the original container. This ensures that the original shellac is not contaminated. 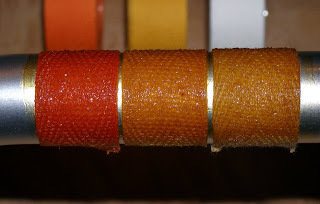 The first coat of shellac will fill the weave of the cloth and use up as much shellac as all the subsequent coats. Brush it on as evenly as possible and don't leave any dry spots. Wait at least a couple of hours after the first coat to allow this first thick layer to dry. The longer the better. The next coat will darken the tape and be much easier and faster to apply. It will also dry in less time, 30 to 60 minutes. You can keep adding coats as soon as the previous one has dried until you archive the desired color and texture. But don't put on too many coats, or the bars will get slippery when wet; leave a little texture. In between coats I wrap my brush in Saran wrap to keep it from drying out rather that washing it. That's all there is too it. Velo Orange red replacement jockey wheels, the $4 model. A long drop front clamp-on cable stop. The long drop version allows for less bend in the cables when using aero-levers. Shims to allow clamping 1" clamp-on cable stops to a quill stem. This is a neat system that allows the stop to go above the headset. 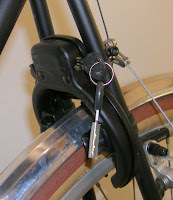 A rear cable stop with angle adjuster. And one new component, Tektro FL730 brake levers. These are a very well made flat bar lever, but with a quick release button for easier wheel removal. Importing these little items can be as much trouble as some of the bigger components, but they can be hard to find at local shops, so we'll stock them. As usual, bike shops can contact Tom at VOI if the're interested in stocking any of these items. We just got our shipment of ring locks. Ring locks are tremendously popular in Europe, but largely unavailable here. They are bolted or clamped to the seat stays of a city bike and lock the rear wheel through the spokes. They provide an almost instant way to lock your bike. 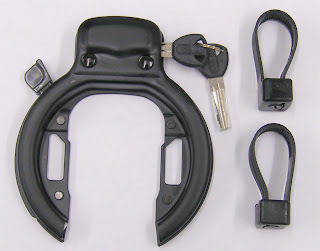 Ring locks are not intended for high-theft areas or to lock your bike overnight. But in many towns, or out in the country when touring, they are all you need for a quick stop. What's great about them is that they stay on the bike. So when you run into a shop or Cafe a simple flick of a locking lever prevents the casual thief from riding off on your bike. For longer stops you can run a cable around a fixed object and lock it in the ring lock. The lock is secured to the seat stays with the included clamps. These simply hold the lock in place; it's the steel ring bolt that secures the wheel. 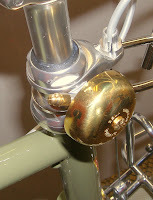 Some European bikes have mounting points so the lock can be bolted on. Includes two keys. Weight is about 385g. $25. The final drawings for the VO skewers arrived this morning and they are ready for production. Arrival in a few weeks. The new style VO Croissant bags, and Baguette bags are in transit. We don't have a firm delivery date, but my best guess is 1-2 weeks. VO handlebar bags have been delayed. We made a small change, the placement of a couple of seams on the piping, and that seems to have stopped everything for a few weeks. VO 17-degree stems are in production. VO French thread BBs are scheduled for production and will be made next time we make our other BBs, probably about 3 months. Grand Cru 50.4mm BCD cranks are far behind schedule, but this is not a priority for us so long as we still have a stock of TA and Sugino PX cranks, so I'm not pushing. 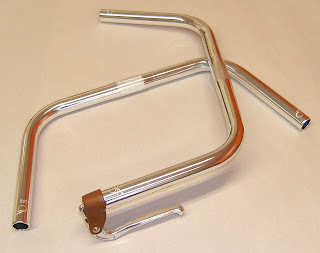 VO Porteur bars are delayed and are now probably 3 months out. There was an unexpected issue that required some new tooling, but progress is being made. The VO Production Randonneuse has experienced delay after delay. I must admit that project management has not been good; we are new at production frames. There have been many tiny changes to both the fork and frame to make it perfect. I'll write more about this soon as I expect major updates this week. The above also goes for the VO production city bike. VO tires have been postponed, too many projects at the moment and we have not found a factory that really meets our needs. VO Porteur racks will be made in a new factory and there should be no more shortages. We expect the new production in mid Spring. We may also have a new rack similar to the Nitto M-12. These will be stainless steel and priced below current offerings. Ring locks are on the way, within a few weeks. Inexpensive hub dynamos are expected in March, maybe sooner. We've been designing packaging for VO products. Since more stores are carrying our products we need "shelf ready" packaging. Once all the packaging work is done we'll be working on VO cable housing and brake shoes again. Designing packaging after the fact has been a real headache. So we're making an effort be more like big component companies and have the packaging ready ahead of time. VO panniers are the next bag project. We hope to have them sometime this summer. Please understand that these delivery dates are only estimates and guesses. So don't plan your build around getting a particular new component on a particular date. By the way, there are over 100 VO products now (if you count all sizes and colors) and we stock almost 500 products from other manufacturers. The illustrations are from a wonderful Japanese artist, Yuzuriha Satoshi , whose site is yuzuriha.com. Click on the cycling link on the left. With today's holiday and the upcoming inauguration shipping at VO will be a little slow. There is no mail pickup today and the roads may be so jammed tomorrow that I can only hope UPS and FedEx make it. Things will be back to normal on Wednesday. Tom and Annette (and Alec) plan on going to the inauguration. I'll be here holding down the fort with the rest of the staff. Tom's initial idea was to ride down, but bikes are prohibited. Annette is hoping the Metro (subway) is not totally jammed. I've lived around Washington DC much of my life and have never seen an event of a magnitude even approaching this inauguration. We went to lunch near DuPont Circle yesterday and the whole city is overrun with charter buses and visitors and limousines. Wow; this really is exciting! The photo is from: http://brickstarsearch.blogspot.com/ which is worth a visit to see the other Lego Obama photos. Of course our son Alec made an Obama Lego display in September and took it down to the local campaign office, where Annette volunteered. Will 26mm clamp size handlebars go the way of the proverbial Dodo. Tom thinks that in a few years all mainstream handlebars will have clamp sizes of either 25.4 or 31.8, mostly 31.8. Should we start changing the specs on VO stems and handlebars now? I happen to think that a tire around 36-38mm is ideal for 650b. For 700c it's 28-32mm. This is for riding on American paved back roads, which are, admittedly, not as smooth as those in Western Europe. That's just my opinion; feel free to have your own. But please don't drink the "wider is always better" Kool-Aid; try various tires and see what you like. If everyone like the same things we wouldn't need to stock 15 different fender models and my job would be much simpler. I'll sit and ponder all this. What do you think? 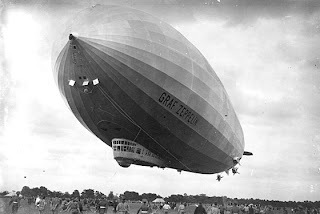 This is just a quick post to let you know that the lovely VO Zeppelin fenders are back in stock. These proved very popular and we ran out much faster than we had expected. Originally available only is 650b size, we now have them in 700c/27" size too. And the new production run is pre-drilled so installation is much faster and simpler. They are 52mm wide and cover tires up to 44mm wide. Like our other fenders they are extra-long to provide more spray protection. The 700c size will replace the 52mm smooth VO fenders . Those are now sale priced, should you want to save a few dollars. By the way, I've been going through our inventory and found a few other items we are slightly overstocked on. So check out the specials section for some other good deals. 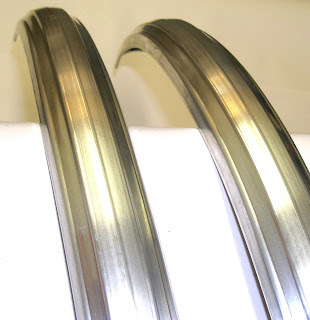 We've been looking into getting some super shiny, but very scratch resistant, VO alloy fenders. These use a new process that I won't say more about yet. They would be more expensive than our current models, but still less than Honjos. Samples are being made. The biggest problem is that we already have too many fender models. It was interesting to see a few comments about logos in the previous post. That's a topic that very much interests me since I've always been anti-branding. In fact that is one reason why there are only two decals on most Velo Orange frames and only small logos on most of our components and accessories. I had originally planned not to have any logos on many VO products, but I soon learned that most folks want them. A salesperson at REI recently told me about their problem with the theft of North Face jackets. I would never buy a North Face jacket precisely because of the huge garish logos on them, but the majority of both customers and shoplifters want them, while ignoring the superior Marmot and Patagonia Jackets one rack over. That huge logo is a status symbol and, ugly as it is, it adds value. Of course the folks who crave the logos won't admit it while elitists like me will sanctimoniously declare their opposition to them; such is human nature. The other issue is that it is fairly easy for another company to sell a component that looks much like a VO part. I found that to be a serious problem at my previous company. Even if we have an exclusive deal with the factory that makes our retro cages, for example, there are other factories that would be happy to make a duplicate--you can't patent a 60-year-old French design. So we will be putting logos on more of our stuff. But you can be sure that they will be as small and tasteful as possible. Speaking of logos, the one on the Park PMP-5 frame pump above is too big. The pump, however, is just great. 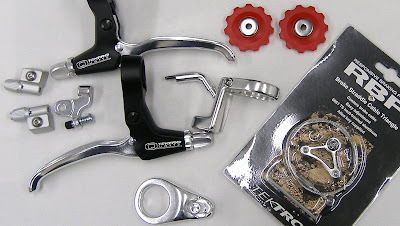 In fact it's now my favorite frame pump and we have just started stocking them. Here's why. First of all its length is adjustable. Those seven little slots allow it to fit almost any frame so you only need one frame pump for all your bikes. The adjustment slots, by the way, are on the bottom and not visible when the pump is on the bike. In addition it pumps to 160 psi (according to Park) and works on both shrader and presta valves. It is new so I can't say for sure, but it appears to be very well made and durable. Finally the handle swivels, making it very comfortable to hold. In all honesty, I now use a Quicker Pro pump much of the time; I simply don't need the speed of a frame pump since I don't do many group rides. But there are valid reasons to prefer frame pumps and this is a darn good one. 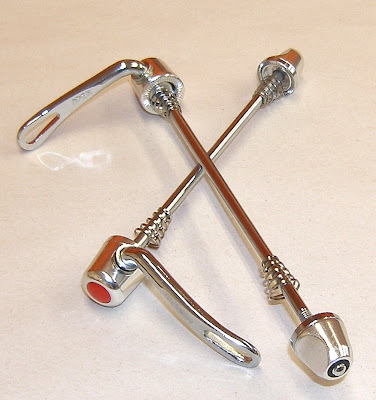 The product that launched Campagnolo was the quick release skewer. During a race in 1927 Tullio Campagnolo, then just another an Italian bicycle racer, flatted and found that he could not remove the wing nuts on his wheel and so could not fix the flat. The sudden cold had so numbed his hands that he couldn't loosen the nuts. Soon thereafter he invented the quick release skewer. Signore Campagnolo got the design right the first time. His skewer had an internal cam that gripped well and was protected from dirt. But in the 1980s someone decided to "improve" his design by using an exposed cam. This made the skewers a few grams lighter and they looked more modern. But they required a larger cam that offered considerably less holding power when the same amount of force was used on the locking lever. 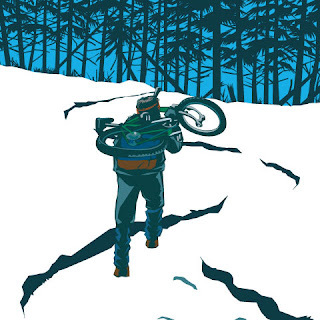 Riders found that they sometimes slipped on bikes with horizontal dropouts or track ends. In addition the cam was exposed to road grime. Unfortunately exposed cam skewers have become the norm. So we decided to make reasonably light, well made, and inexpensive internal cam quick release skewer. Here they are: This skewer is made in a very well regarded Taiwanese factory that makes only skewers (They are specialized). The acorn nut, the one without the lever, is alloy, but it has a chrome steel face pressed on for better grip and durability. It also has a nylon insert to prevent loosening. The other end also features an alloy housing, however the lever and cam are chromed steel so they won't break when you over-tighten them. As for aesthetics, there is that red/orange plastic dot at the end. It levers right off with a knife tip if you don't like it. But we are thinking of having the Velo Orange logo laser engraved in it's place. Around $16-$18 a pair. Waddaya think? We hope to have them in mid-March. We have the fixie wheel sets in stock now. The new VO handlebar, croissant, and baguettes bags are almost finished at the factory. We will try to get one or two cases of each shipped by air, since many of you have been waiting for them, and the rest by ocean. 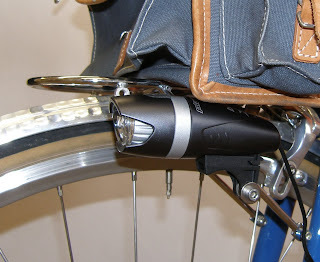 We'll soon have the new Spanninga LED dynamo lights. 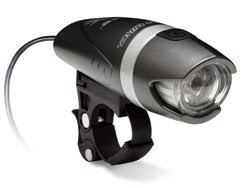 We've just started stocking the new Planet Bike Blaze Dynamo Light. This is a very well made 1-watt LED lamp and at $58 the price is right. It even has a stand light. The problem is that it comes with a handlebar clamp. It's a very nice handlebar clamp to be sure, with a cam and a quick release feature. But most of us prefer our lights mounted lower, on the front rack for example. There are a couple of ways to do this. We removed the strap and cam on the mount; they simply unscrew. Then we used a spacer, washer, and a screw to mount the light to a VO Light Bracket. The spacer goes between the two sides of the mount; it'll be obvious when you remove the cam. This spacer can be some washers, or a nut, or best of all an old chain ring spacer. 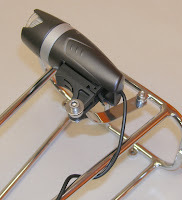 Now the light can be mounted on your rack and it sits in an ideal position below the handlebar bag. Another way to mount it is with a type-1 Low Down mount. Belleville Bars Are Here! And More. After a nice vacation cross country skiing in the White Mountains we returned to find some new Velo Orange Products had arrived. The long awaited Belleville bars are nicer than we expected with lovely polishing and a smooth even bend. You may remember that these are our version of what is probably the most popular style of French city and utility bike bars ever. They are 43cm wide ( or 45mm outside-to outside) and have zero rise. That's fairly narrow for a city bar which is an advantage in traffic. They are made of road bar sized tubing. 23.8mm, and accept inverse brake levers or bar end shifters. The straight grip section is a generous 150mm. The VO logos are lazer etched under the grips. We are so pleased with the quality from this little Taiwanese handlebar factory that we are asking them to make our upcoming VO Porteur bar. 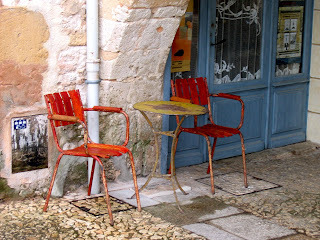 It will be much like the very popular Belleri porteur bar we used to sell (unfortunately those are no longer made). 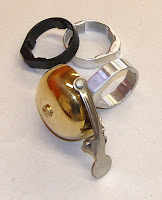 We also have an improved version of our ever popular VO bell mount. This was the very first Velo Orange product, the mount that launched a company. The new version has longer threads and a few other minor improvements. We also just got more VO 45mm stainless steel fenders, now pre-drilled. And we have a new shipment of VO 45mm anodized fenders.